We visited with them as they were getting ready to leave, in the early Montana light. Here is a fine team of three. We have been fortunate to know Balyn for several years, and were quite excited that he made an overnight stop to see Doc and I at Borderland Ranch to take an overnight break in his travels with his new team, Bruce and Bud, from eastern Montana to Western Washington. Balyn is now working his own farm with wife Ellie, in North West Washington. Please join us wishing them well as he puts these nice boys to work . Balyn, a 30 something Californian, has been gardening and farming for more than 10 years. All of his early gardening and farm work was on fairly small scale family and market gardens. These gardens were cultivated by hand or with minimal tractor work to assist the human power. Balyn’s interest in gardening and farming intensified while he was studying agro-ecology and environmental studies as a student at the University of California, Santa Cruz in 2004 http://casfs.ucsc.edu/. In 2012 Balyn and wife Elli began working as farm managers of WHOA (Work Horse Organic Agriculture http://whoafarm.org/), a non-profit organization that grows food for donation to Sonoma County (California) agencies serving people who do not have access to or cannot afford fresh, wholesome, healthy, organic produce. WHOA also advocates, promotes, and supports working farms and gardens in a sustainable way with horsepower. Work Horse Organic Agriculture, Inc. (WHOA) is a 501(c)(3) non-profit that was established to promote the use of draft horse farming to support sustainable and organic agriculture in Sonoma County. All food grown by WHOA is given away to organizations in Sonoma County that serve people who do not have access to fresh organic produce. has been a truly rewarding endeavor for Ellie and Balyn. In 2011, at the urging of the Gelsman Family,( WHOA founders), Balyn spent time with 2 two young Doc Hammill protégés and organic farmers, Ryan and Adam, who own and operate New Family Farm near Sebastopol, California. 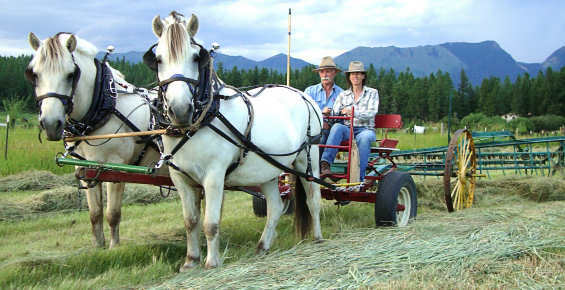 Their sustainable farming practices include using draft horses rather than motorized equipment to work the land. There, Balyn observed Ryan and Adam work their Belgian draft team doing cultivation, planting and harvesting. Eventually, Balyn spent some time working with the New Family Farm horses with Adam and Ryan. In July of 2012, Balyn spent a week in one of Doc Hammill Horsemanship’s five day Workhorse Workshops at Therriault Creek Ranch near Eureka, Montana. During the intensive, immersion style workshop, Balyn learned about the nature of horses’ learning, their body language, their emotions and behaviors. 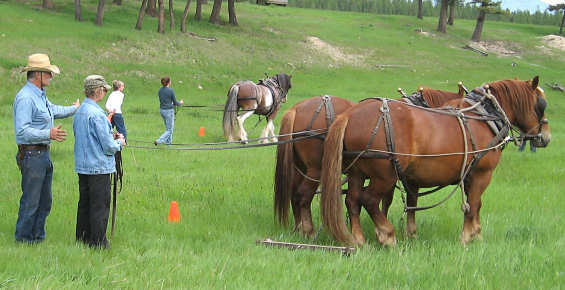 Balyn and co-students also worked horses doing many hands-on activities, including harnessing, collar fitting, ground driving single horses and teams of two, driving singles in two wheeled carts and hitched to plows and other cultivation equipment. 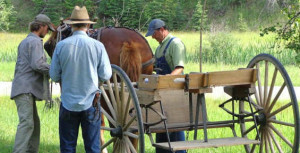 The students also hitched and drove teams of two horse teams on wagons, a Pioneer Homesteader, and various other pieces of farm equipment to give them a well-rounded intensive experience of working and driving horses in harness safely and comfortably. By 2012, WHOA operations were centered on an 11 acre patch of fertile ground in Sonoma County, California. As farm manager, Balyn, built infrastructure on the new WHOA farm and began produce production. 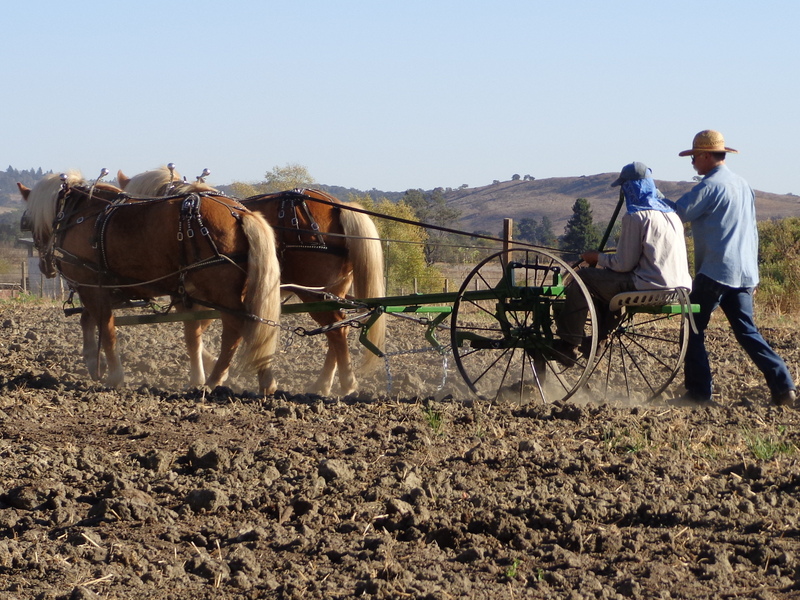 In the Fall of 2012, WHOA Farm acquired a team of Haflinger geldings and a Percheron mare to help out with cultivation, planting, harvesting, as well as other farm chores. After the horses arrived at WHOA Farm, Balyn and the Gelsman Family called upon Doc and Cathy to continue with their mentor-ship of Balyn’s natural horsemanship and teamster skills. Doc and Cathy have made on-farm private instructional visits to WHOA FARM, where they have coached and mentored Balyn as he encounters new opportunities while working with the horses. Doc has worked directly with the horses as well. 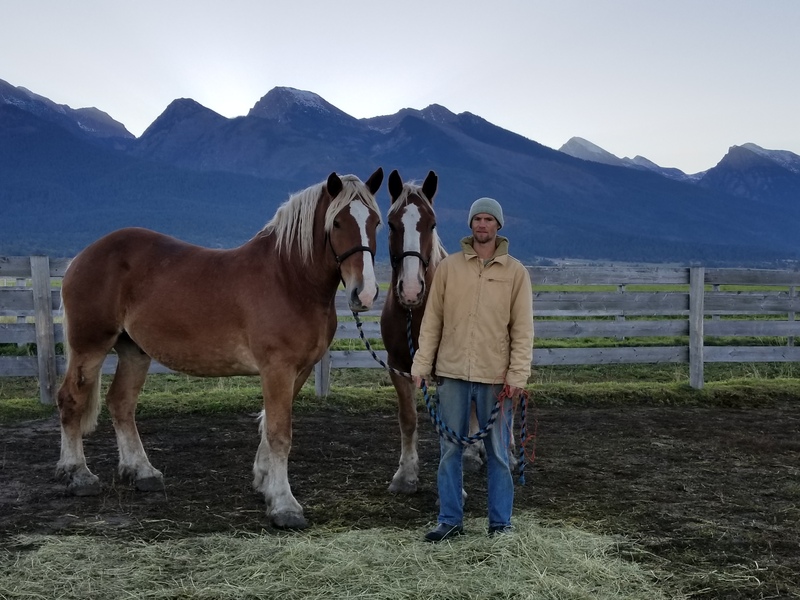 Balyn continues to cultivate and grow his horsemanship skills by taking advantage of Doc’s long distance coaching and mentor-ship opportunities, Doc’s instruction horsemanship DVDs ( https://dochammill.com/?page_id=29 ) and on-going workshops. In 2012, WHOA sponsored a Doc Hammill Horsemanship Driving and Working Horses in Harness Workshop, and another is being planned at the WHOA Farm in the Fall of 2014. Do You Dream of being the Leader and Partner Your Horse Needs You to Be? develop Trust, Respect and Leadership in your relationship with your horse? feel safe, comfortable and relaxed while interacting with your horse? understand what your horse’s behavior is telling you? understand what your body language is telling your horse? Come, join us for a very special time at our Montana ranch and acquire the horsemanship skills you have been wanting to achieve. Reserve your spot now! Contact Doc at workshops@dochammill.com or call him at 406-250-8252 for reservation details. Become one Doc’s many successful students! We are currently booking for our 2014 Montana Workshops; We would love to put your name on our list of successful participants.